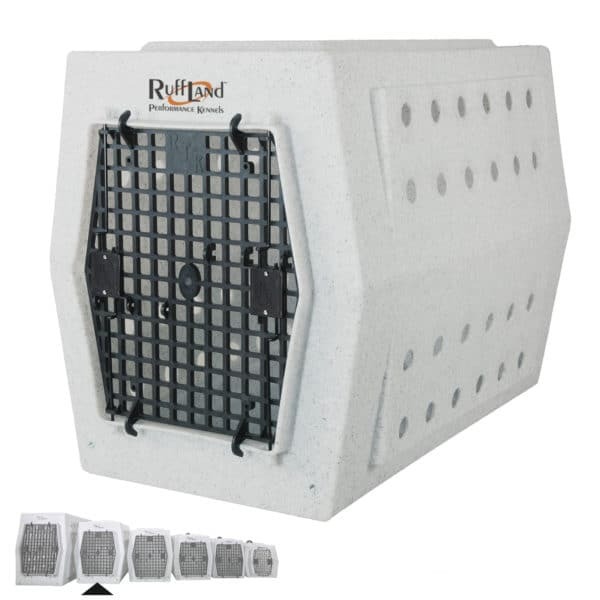 This large dog kennel is perfect for your larger breed dogs or for kenneling at home. It can be stacked or coupled for transport in a boarding or vet clinic setting. Vent hole pattern displayed comes standard (1 3/8"), with two finger holes in the back. Due to the fact that Ruff Land does not have personal knowledge of your pet we prefer not to recommend sizes of kennels. We feel consulting with your trainer or vet would give you the best results for sizing. Thank you for your understanding. The walls, top and floor on Ruff Land™ Kennels also have built-in flexibility which absorbs energy that would otherwise be transferred to your dog. This is where the “stiff”, two-walled plastic kennels, which claim to be safer, fail. They may not break, but when your dog hits the side of the kennel, there is no give like there is with a Ruff Land™. 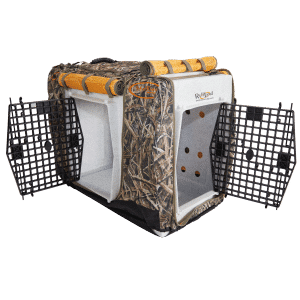 The tops and bottoms of Ruff Land™ kennels all feature form-fit nesting that allows the kennels to fit together, making them stackable. 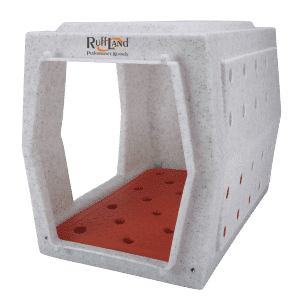 The sidewalls on all Ruff Land™ kennels feature a series of vent holes. 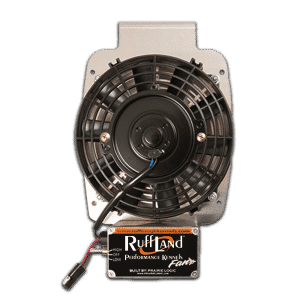 These vent holes ensure proper air circulation for your dog. Ruff Land™ took this one step further by tapering the side walls so that the vent holes will never get plugged, even if you slide the kennel up against a wall or some other flat sided object. The interior floor in a Ruff Land™ kennel is raised so that debris and liquids that fall or spill off to the side are channeled away from your dog. This UpSide™ raised floor design also creates some flex for a built-in cushioning effect for your dog as it rides in your truck. They are ambidextrous and can be adjusted to swing either way. 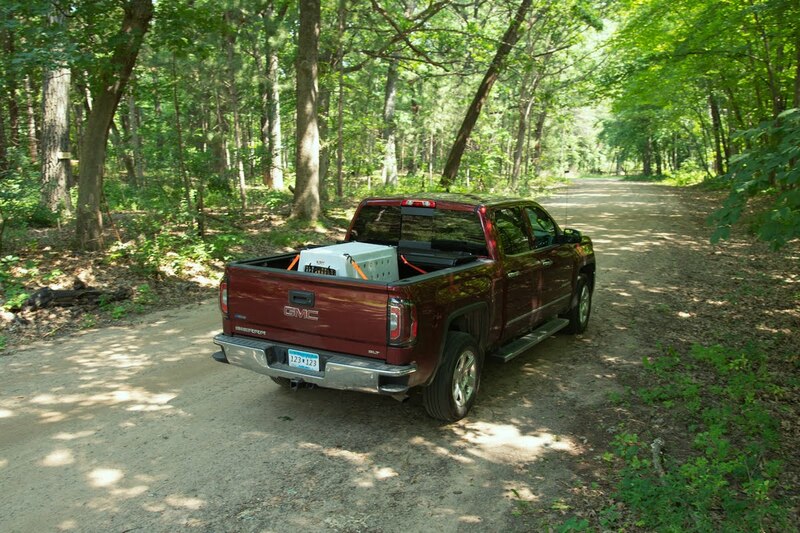 Select Ruff Land™ kennels feature a SlantBack™ design, an angled back end that fits perfectly up against the canted second seat on most SUVs. What is the width at the base, and top of the Large Kennel? What is the standard vent hole arrangement for Large Double Door (Front & Left Side)? Is it as shown in picture on website (four rows of vent holes on side (two on upper and two on lower)? 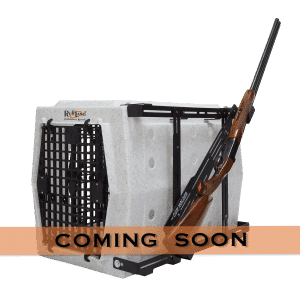 My father and I split the cost of two of these kennels for our chocolate lab upland dogs and they have been a solid, dependable part of the care that goes into owning bird dogs! We’ve used and abused these kennels, constantly transferring them from vehicle to storage, house, etc. and they have held up to the task. Easy to clean, safe and comfortable for the dogs, the list can go on! These kennels are a great product and I would recommend them to anyone looking to invest in a solid, sturdy movable home for your pup! Are the dimensions for the suv model the same as the regular? What is the warranty on this kennel? Can you confirm the exterior measurements? You show a 1/4″ wider interior measurement than the exterior width.